Standing in a three to four-hour line for a mayonnaise-stuffed cake covered in seaweed and beef. Yum. Find out if it was worth the wait inside. 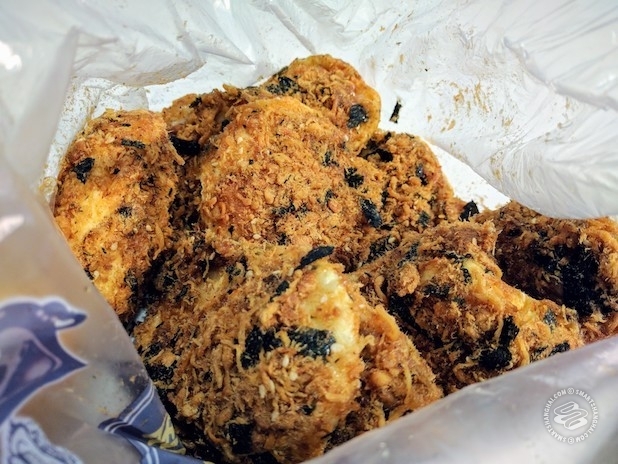 The item: Seaweed Xiao Bei (海苔小贝) and Beef Xiao Bei (牛肉小贝) -- a small cake with mayonnaise in the middle, covered by a layer of more mayonnaise, seaweed flakes, and beef floss (dried meat made light and fluffy). I'll call them lil' baes (similar meaning as bei in Chinese). The wait: It depends. Go in the early morning (before 8am) or late night (after 9pm), and you might wait for one to two hours. Go in the afternoon, and you'll find people having waited for four to six hours. 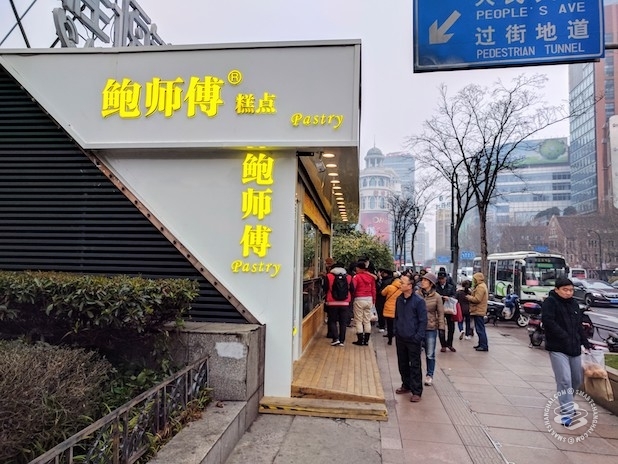 A little background info: Baoshifu is a pastry chain from Beijing. 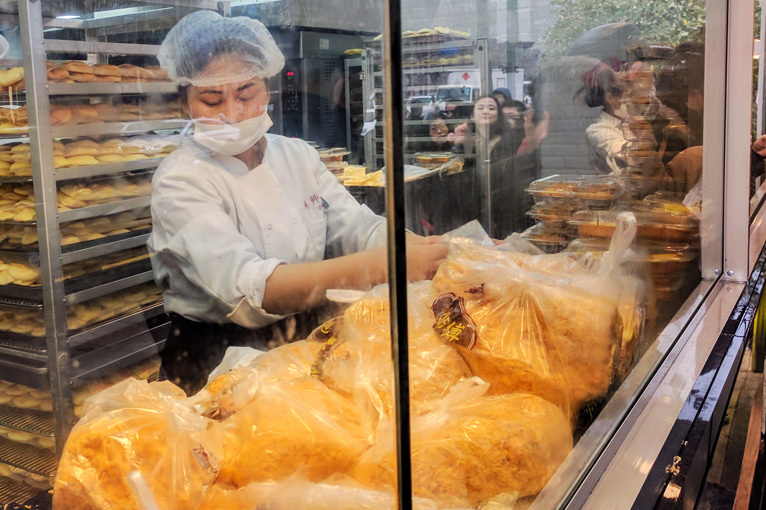 It's the kind of affordable Chinese pastry shop that sells items like pork/beef floss cakes, pineapple cake and egg tarts, sans bread, cheesecakes, and croissants. Their beef floss cake is the "must-have", priced at 19rmb / 500g and 29rmb for the seaweed flavor. Yep, it's that kind of affordable Chinese pastry shop where cakes are sold by jin (斤) (a half kilo). Very old-school. It's hard to trace when exactly the company was founded, but it's been running for at least seven years. It's pretty well-known among Beijing foodies, although not to the point people would queue up for hours. In late 2015, Baoshifu expanded to Tianjin, attracting instant fame. Earlier in February, when the city was still rainy and windy, Baoshifu opened its doors in Shanghai. 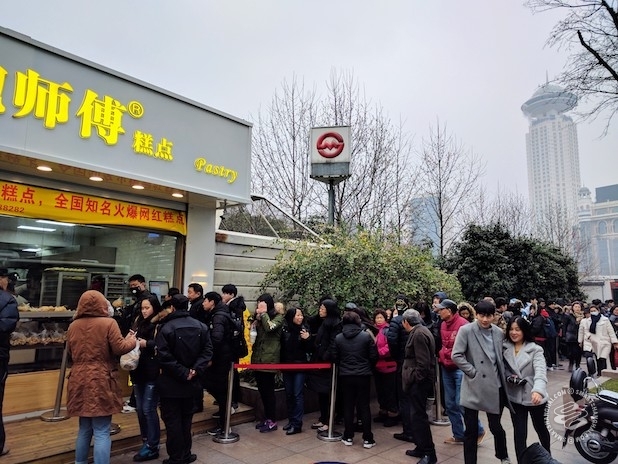 Currently they only offer three items: two types of cake and one type of egg tart (3rmb). It has a perfect location, right outside Exit 3 of People's Square Station. Even with its established reputation, Baoshifu was almost unknown among Shanghainese. But with the help of WeChat and especially "we-media", I kept coming across the same story again and again. A quick search on WeChat explained how Baoshifu went viral. "Beijing internet sensation invades Shanghai! 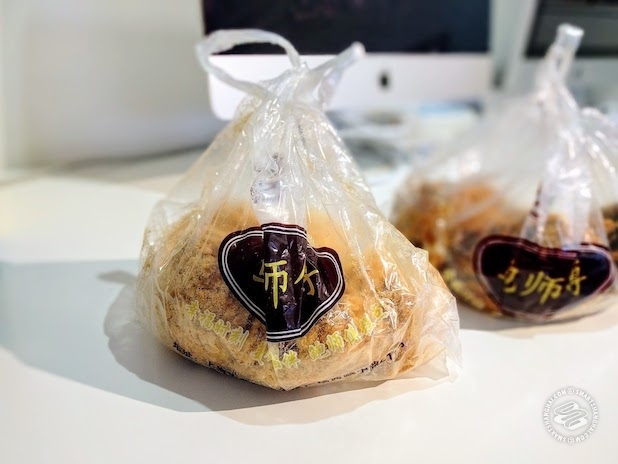 ..."
"Insanely popular Beijing pastry shop arrives in Shanghai! The line is wayyyyy longer than Disney's." It's been two weeks since Baoshifu launched its business. And Shanghai's weather remains gloomy and chilly. When I got there around 9:30am, a long line of customers came into sight. There's a line to get a numbered ticket, which lets you order when your number is called. Or you can wait in another line to order directly when you get to the front. It's a bit of a confusing mess, but supposedly the number line is faster -- only a 3 hour wait. The reason why it's so slow is because they only make a batch an hour. Each person can buy two kilos at most, and that's what everyone does. So one batch runs out quickly. On my way to the back of the queue, huangnius were everywhere. They received zero attention from neither the security guard nor the shop manager. 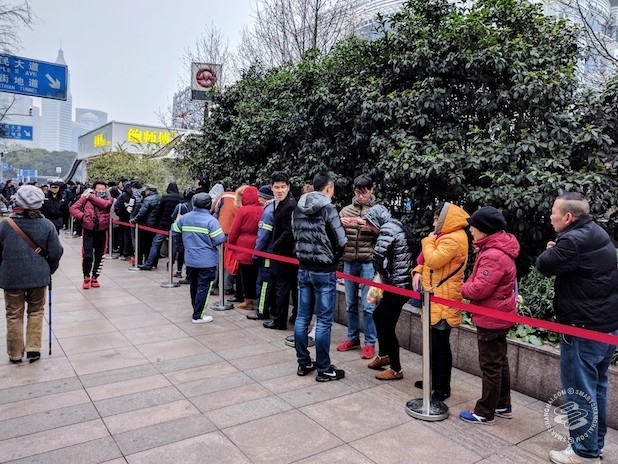 Some were queuing among the customers, offering 80rmb for a number (occasionally, they would jump to the front of the queue of young people who couldn't take eyes of their phones). Some were approaching customers who'd already made their triumphant return. Then I saw a couple of young fellas all in black, maybe in their early twenties, each holding two bags of cakes and chatting calmly near the crowd. I knew immediately that they're ones I was looking for, and asked them how much they charge -- 107rmb for a bag, which contains 500g of both flavors. Sounds reasonable compared to the 80rmb number. Deal. For expats, mayonnaise + beef floss + cake might seem like a strange combination. Kind of off-putting. Maybe really off-putting. 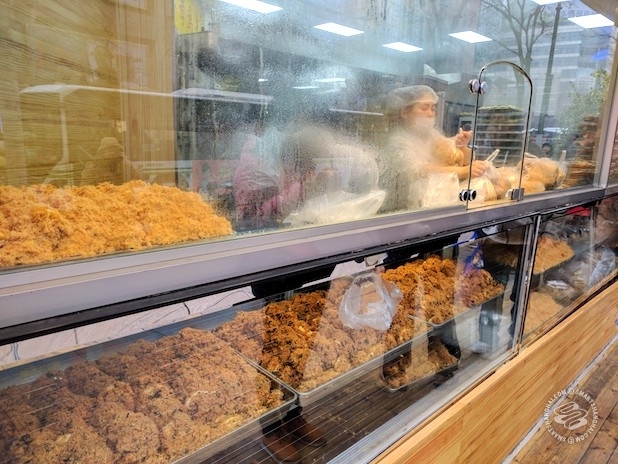 But pork floss bread is a necessity at Chinese pastry and bakery shops. And to our taste buds, they're quite delicious. Lil' baes offer no mind-blowing concept. They're quite messy, though, because of the thick layer of cheap mayonnaise and beef floss, which have nonetheless won the hearts of many. It's the kind of food that instantly reminds you of cardiovascular disease. But they taste okay. Seaweed lil' bae is pretty good, actually. I ate two in a row. 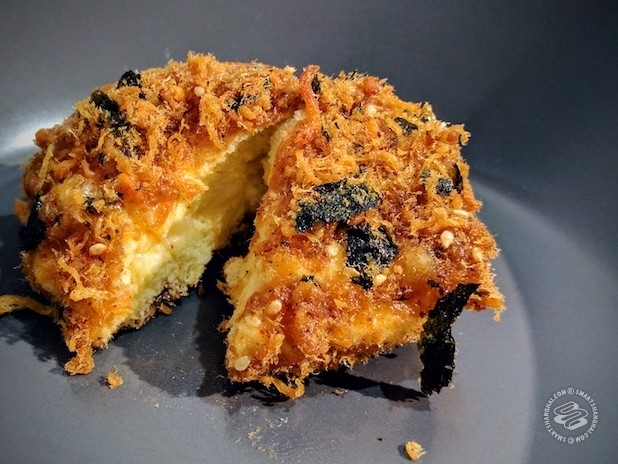 The cake is soft and spongy, the beef floss and crispy baked seaweed is almost addictive. On my way back to the subway around 10am, I saw a girl carrying a few big bags of Baoshifu. She told me she's been queuing for them since 8am, and she's not a first-time buyer. "They are quite good, worth the wait. My friend once waited for six hours, and that's totally not worth it", said the girl. She was very well-spoken, with a smile on her face the whole time. The pastries are for her parents, because they love them. At least that restored my faith in humanity just a little bit.